A few months ago I started looking at various options for omnidirectional antennas with circular polarization for satellite communications. I came across the TA-1 137 MHz turnstile antenna from Wimo, which looked like an interesting option for a reasonable price. Last week I have tested the RTL2832U-based ezcap EzTV666 DVB-T dongle on the air using various VHF signal. One of the reasons I have been very excited to get the WBX transceiver daughterboard for the USRP is that with one single RF board I can have a full duplex transceiver covering both the 2 m and 70 cm amateur radio bands. This is where most of the amateur radio satellite traffic takes place, including FM, SSB, CW and packet, though modulation is really not an issue when we have a software defined radio transceiver implemented in the GNU Radio framework. In order to use the WBX transceiver for this purpose, I need to add low noise preamplifiers (LNA) in front of the receiver and power amplifiers (PA) to boost the output of the transmitter. I need them for both bands, since some satellites are in V/U mode, others in U/V mode. Using the usual single-band devices is not optimal, because it would require 4 external devices and a bunch of wiring and switching. That could become too expensive. Therefore, I was looking for devices that cover both bands. I have often seen wide band LNAs and PAs that would cover both bands and much more; however, I was slightly surprised to find one box that contains both LNA and PA for 2 m and 70 cm – and can even work in full duplex! This is the Microset VUR-30 which is available from Wimo. Requires 1W input. The WBX can give up to 100mW. Hope it will work at reduced output without needing a buffer amplifier between the WBX and the VUR-30. For some reason I can not find much details about the VUR-30, not even a photo of the rear end to see how it connects to the radio and antennas (one or two connectors, etc.). But from the brief specs and the front photo it looks promising and the price is low enough so that I can just go ahead and buy one. This video shows my first on-the-air tests with the WBX transceiver using the USRP (Universal Software Radio Peripheral) and GNU Radio. The receiver was tested using wide band FM broadcast, APT signal from NOAA 17 satellite and Copenhagen VOLMET. I have also performed some tests using DVB-T signal and wireless sensor signals but I wanted to keep the video short so these were not included. I can post them in separate videos if there is interest. It was a good day today. At long last, I have received my WBX transceiver boards for the USRP! I have been waiting for this transceiver board for quite some time now because I didn’t really have and transmit capabilities in the VHF and UHF bands. This board was expected to cover 50 MHz to 1 GHz, so it was perfect as VHF/UHF transceiver. On January 13, Matt Ettus has finally announced that the WBX transceiver is now available. There were more good news in the same announcement. First, the specs have changed and the WBX transceiver actually covers 50 MHz to 2.2 GHz (instead of up to 1 GHz). The improved specifications come at an improved price, namely $450 instead of the expected $400; however, the introductory price for first batch was kept at $400. Needles to say, I ordered mine within a few days. 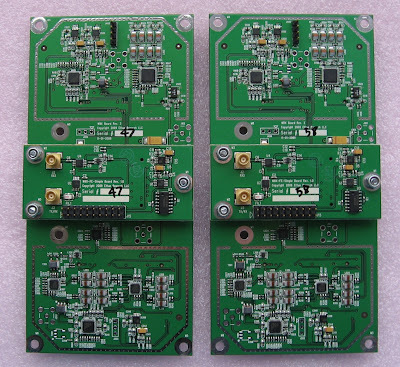 What do I want to do with a 50 MHz – 2.2 GHz full-duplex transceiver, you might ask… Satellites of course! With most linear and FM satellites working in the VHF and UHF band, this transceiver seems optimal. With the new specs it can even cover the 1.3 GHz L-band, which I think is used for AO-51 uplink. Even in non-amateur space communications this transceiver board provides interesting opportunities: Weather satellites on 137 MHz and 1.7 GHz, GPS on 1.2 and 1.5 GHz, space research S-band communication uplink on 2.1 GHz, and probably many more that I do not remember. You may say the noise figure is not too impressive and indeed, you may find something with a few dB’s better for such wideband coverage. But does it matter? You will most likely have a long coax cable going form antenna to the receiver, therefore, you will need a low noise pre-amplifier at the antenna anyway and that will improve the system noise figure significantly. Since initially I will be focusing on VHF/UHF applications, the only useful comparison for my case would be to the TVRX daughterboard, which covers 50 MHz to 850 MHz and has a noise figure of 8-10 dB. The WBX is significantly better than that. First, I have to start upgrading my GNU Radio installation(s) to the latest development code to get the drivers for this board. Currently, most of my computers run GNU Radio 3.2.2 on Ubuntu 9.04 simply because of the convenience of having the DEBs. I did, however, make some test builds last week and had no trouble installing the current development code. So this should be no problem. Finally, I’ll work on the software. The building blocks are all there and there are even examples implementing most of the functionality I’m looking for. Unfortunately, the proof-of-concept like examples leave a lot to be desired on the ergonomic areas of the UI. I don’t know if I’ll be able to do much better in wxPython; I have a few ideas for minor improvements that would have significant impact. In the long run, I’d like to have a C++/Qt implementation anyway. I’ll post updates and videos as I make progress. Edit 2010-01-27: Schematics of the WBX transceiver are now available in the Ettus document repository.